If you saw my post last week — ten breweries that I think have excellent label designs — you hopefully got the impression that good labels are important, not incidental. Labels, more than just looking cool, reflect the personality of a brewery, allowing a window into their intentions and passions. This is also true for homebrewers, though we're generally in the same boat as a small, cash-strapped nanobrewery with no staff — who has the resources to hire an actual graphic designer? Fortunately, making labels yourself can be fun, and relatively easy. A number of amazing, professional-looking labels are made without hiring an outside design firm: labels from Night Shift Brewing, Hill Farmstead, Maine Beer Co, White Birch (and plenty of others) keep it simple, yet manage to produce some of my favorite labels in the whole industry. It's important to remember that restraint and uniformity are very classy; minimalism can be eye-catching on a shelf lined with cartoonish clipart labels. While I still have a lot of improving to do as a brewer, I figured it wasn't too early to establish an aesthetic for my "brewery." Even if many of these labels are for beers that are potentially years away from being finalized and perfected.... why not? Making a label helps me to solidify the direction I want to go with them. And in a broader sense, solidify the direction of my "brewery," meaningless as that may seem for someone who brews 4 gallons at a time in their kitchen. The type of beers I brew tend to be rustic and a little odd — without even thinking about that specific connection, my labels ended up having the same aesthetic. Many of them are old-school in spirit, though not exactly traditional. There's a tendency toward the wild and nature-inspired. And so on. But a picture is worth a thousand words, and a beer is worth a thousand pictures, so here's a slideshow of the labels I've produced so far. Clicking on any of the "slides" will take you direct to my Flickr, where you can view a larger version of the label. Or, just click the fullscreen button and the whole slideshow will be enbiggened. 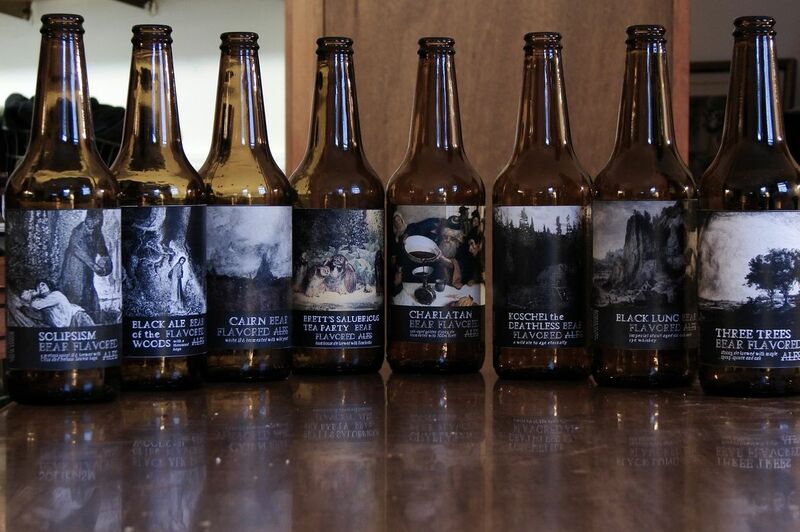 If you enjoyed those, here are some tips for making your own beer labels. Don't think of this as a how-to guide, because your labels will (and should) not look exactly like mine, and you will have different goals and aesthetics in mind when you're designing them. (Also, it's not like I'm an actual graphic designer, so if you know one, take their advice instead). Tip 1. As I mentioned above, making labels can be really beneficial for finding the direction of your brewery. Use this as an excuse to find a unifying theme between your brews. Consistent labels look better than scattered, totally unrelated designs, so it never hurts to ask yourself: what inspires you as a brewer? What sort of image do you want to convey? Are you serious, flippant, or somewhere in between? Perhaps your brewery will have a very specific theme (music, animals, your city, your ancestors, local landmarks, etc.) or perhaps just a broad aesthetic, like "wild, rustic and unorthodox." Tip 2. A photo editing program—like Photoshop, or GIMP—was the easiest for me, but my labels purposefully don't rely on any sophisticated graphic design elements. My labels are based around an unaltered image and text. There may be easier design programs out there, but it's usually best to stick with what you know. Tip 3. Figure out what you're going to base your labels around. (This relates to Tip 1, as well). Are they going to be artwork based? Can you provide artwork that looks good, or find it online? Photography based? Clipart based? Text and color based? Logo based? Be realistic. Attempting to create advanced, complicated designs outside of your skill level can result in labels that look half-assed, even if the idea was good. In my case, vintage artwork (which is often Public Domain) was perfect for the aesthetic I wanted to convey, anyway. Tracking down appropriate artwork requires hours and hours of Googling, but no advanced design skills. Tip 4. Getting a functional layout is much harder than it would seem; at least, it was for me. I spent months tweaking my labels before I was happy with the basic design. If you looked at the different drafts now, they would all look pretty basic, and none are a huge leap from the other; you would wonder why it took so long to get them where I wanted them. Try to get a feel for why certain elements and text look good in the configuration they do by examining other beer labels. You want to present information clearly, without it looking like you blindly inserted a text box in a random corner and just started typing. Tip 5. You have probably read elsewhere that many homebrewers use milk to stick their labels to the bottles. Unlikely as this may seem, it's true: milk makes for a bizarrely effective glue. The labels will come off in water fairly easily, but this is probably more of a positive than a negative for most homebrewers. Tip 6. I should mention that I don't print labels for every bottle in a batch. That just seems like way, way too much work. I generally just do one bottle for display purposes, and then extras for special occasions, or if I'm sending beer to friends. Tip 7. Finally: what paper is best for labels? Actually, I need tips from you guys on this one. Regular printer paper seems a little too thin and lackluster; the images on the label look too "printed." I picked up some heavy-duty matte photo-grade paper, which is actually too thick, and hard to glue, although the images look much better. What is the ideal paper for printing labels? What are small nanobrewers using for their labels? I haven't quite figured it out yet, so I'd love to hear your thoughts. I have been a fan of your labels. You do a great job of making them each different, but keeping enough consistency to make them noticeable as the "Bear Flavored" brand. Thank you kind sir. Good tip on the paper. I was eyeing a few of the packs of business / letterhead paper but ultimately went with the matte instead, alas. I love making beer labels even though I don't bottle very often. Your labels look just beautiful. Great Labels and full of thoughts....keep on!